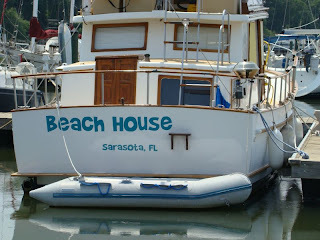 As of now Beach House is official with her name on the stern and documentation number permanently affixed. We have been putting this off because the hull, although in decent condition, will be in need of a new paint job in the next couple of years. 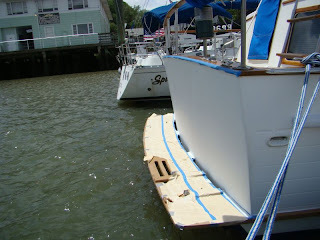 We didn't want to spend the time and money to paint or have vinyl made up for the stern and then take it all off for painting, so before the name went on, the stern needed to be done. In between two weeks of rain off and on, we were able to get three coats of AwlGrip 545 primer on and three coats of AwlGrip Cloud White. As is our usual practice we were able to roll the paint on without tipping and it looks as if it has been sprayed. We know that because the owner of the local yard came by and ask how we sprayed it in the water. We had the vinyl lettering made up by Speedysigns, http://www.speedysigns.com/ , and they did a fantastic job, shipped them to us quickly and were exactly as we ordered. They have a great web page, http://www.speedysigns.com/lettering/lettering_tool.asp , that allows you to try out the different fonts and colors. They do graphics and all kinds of lettering and banners, so they can handle almost any request. The installation was easy. The surface needs to be clean and the graphics taped in place and marked with a pencil. There is an applicator kit available and we recommend it. Once you are satisfied with the placement, the graphics are folded back half way and the backing paper is removed leaving them on a clear vinyl covering. The applicator fluid is sprayed on the area and the graphics are lined up with the pencil marks you have made. The entire surface is squeegeed to remove all air bubbles and then the clear vinyl covering is removed leaving only the graphics. A final squeegee is all that is needed and you are done. With one half done, the process is repeated for the other half. The results look fantastic and we have found in the past the vinyl is more durable and longer lasting than paint. And the cost is about 1/10th of what it would have cost us to have someone come to the boat and paint the name on. We are also replacing all of the old canvas. Much of it is aged and worn and showing signs of severe wear and tear. 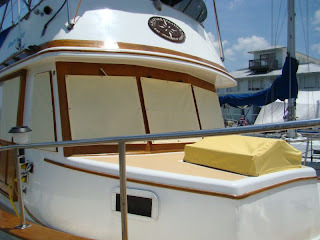 So far we have made window covers for the lower helm station, screens for the port and starboard opening windows, a cover for the forward hatch that we just refinished, and the biggest project of all, a new bimini top. This was a week long project in itself and this is only the second bimini we have ever made. It was quite a while ago since the last one so it was a learning experience all over again. 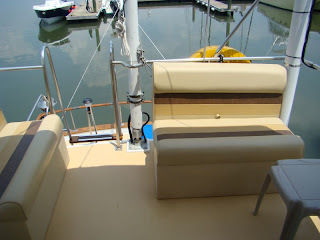 Several years ago we spent the money and bought a good Sailrite sewing machine. They are expensive but this was some of the best money we have ever spent. Being able to do our own canvas work has saved us thousands of dollars over the cost of the machine. To make the window and hatch covers, as well as the screens, we made patterns out of heavy brown paper and transferred them on to the fabric. But with the bimini, we measured the width we wanted it to be, calculated the length based on the stainless frame and add about ten inches to each end. Using 54 inch material we sewed the center for the two panels and then sewed the hems down both sides. Once this was completed we set up the frame using packing tape to hold it in the position it would be with the bimini up. Then the new material was laid over the frame and clamped in place with upholstery clamps. The ends were marked to follow the shapes and curves of the frame and allowing the extra material to overhang the ends. this would be used for the end pockets with zippers. The position of each bow of the frame was marked with chalk on the underside. 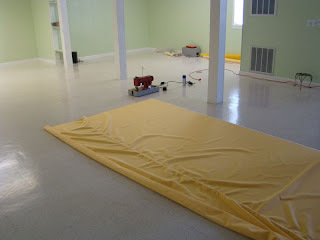 Then the material was removed, placed flat on the floor and the ends cut as marked. The end pockets for the zippers and the pockets for all of the bows of the frame were cut, hemmed, and the zippers added. We also put some additional stainless supports on the frame to eliminate the need for straps to hold the ends tight. After it was finished and placed on the frame it looks great. By doing this ourselves we probably saved about $2,000.00 or more if we did not count our own labor. We are by no means professional canvas makers, but our results have been pretty good and we are very satisfied. Progress is being made and we have more canvas work to do. 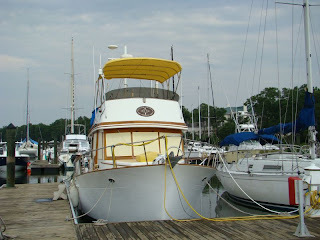 Painting of the fly bridge and finishing the flybridge teak is now at the top of the list. 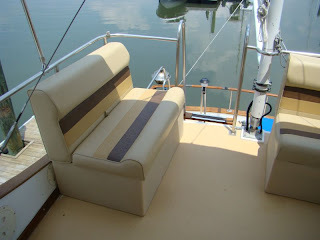 We have purchased two bench seat that are designed for pontoon boats and mounted them on the flybridge. They look good and give us more storage space, which was our biggest consideration for this purchase. 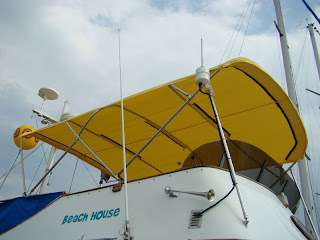 We purchased them from http://www.pontoonstuff.com/ and are very pleased with the product and their fast shipping. They arrived in about three days and took all of 15 minutes to assemble. All of our projects should go that easily! So that is how the makeover has gone so far. We will keep posting as things progress and we hope you enjoy the information and find some of it useful. Awesome blog! I will be buying a trawler for the loop next year so your info is very helpful. Have you done a tutorial on how to roll AwlGrip to a sprayed looking finish?